Arsene Wenger couldn’t quite underpin what went wrong. After the game, he tried to rationalise the surprise 3-2 defeat by saying Manchester United still had a team acquired for millions more than Arsenal, but in the end, the damage was done by a rookie striker. “I can’t fault our commitment, our spirit, our desire – unfortunately we conceded two easy goals,” he said. Which is partly true as they were avoidable goals, the two finishes by Marcus Rashford coming minutes within each other but Arsenal perhaps took the focus off their defensive intensity at the time. Yet, although the first goal came about through Walcott losing the ball by dribbling in his own half, the second probably exposed the lack of cover Arsenal had in the wide areas and United were able to break into space. Nevertheless, there were other such occasions in the first-half that United could run into the spaces, and when the third goal went in, The Gunners attacking players were caught desperately up field. Defeat was a bitter blow to Arsenal’s title chances, although not fatal yet. 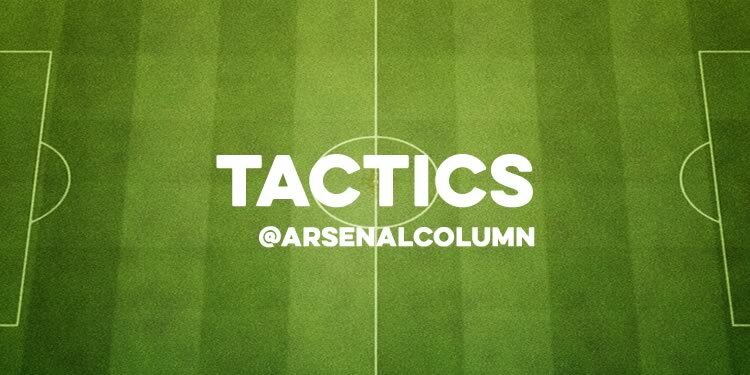 Questions shouldn’t really be about if Arsenal have the quality to turn it around but rather, if that quality can offset the structural deficiencies that they have in both phases of their game. As such, culpability is more Wenger’s rather than the lazy assertions that this team hasn’t got the “mental courage” to grab hold of their own destiny (though there is perhaps truth in that), because as I try to briefly analyse below, they’re frequently undermined by the way they’re designed to play. Firstly, a word on Manchester United, who deserve credit for stifling Arsenal for much of the game, and the game plan that contributed to stopping Arsenal from mounting a serious response in the second-half. Louis van Gaal set his team out to man-mark Arsenal in the midfield, actually very much like he did in the reverse fixture where Manchester United lost 3-0. That time, United were unable to get close to Arsenal’s midfielders because The Gunners simply bumped the ball off quicker, and were able to evade United’s largely immobile press. This time, the personnel was completely different with Morgan Schneiderlin holding the midfield, and Juan Mata and Ander Herrera playing higher off him in a staggered three. As such, the shape was far better to close Arsenal down – less intense up the pitch perhaps, but able to get tighter on the way Arsenal like to build from the back. Generally, they took turns tracking a man whenever they entered their zone, unlike at the Emirates where each of the midfield three had a designated man they would mark – Rooney on Coquelin, Schweinsteiger on Cazorla, and Carrick on Ozil. With this structure, they were better able to account for the unique way Arsenal rotate the midfield, with often the deepest player, Coquelin, actually higher in the build-up than expected. This is where Manchester United went wrong last time, getting Wayne Rooney on Coquelin who acts, not as an outlet, but as a decoy, using his runs to drag players out of position to create space for passes to be played into. Nevertheless, Cazorla was the key player in that game and Bastian Schweinsteiger was forced to follow him deep into Arsenal’s half from where he could take him out of the game. Here, Herrera started closely on the same line with Mata when United had the ball but in the defensive phase, tried to get back closer to Schneiderlin so that if anybody made the decoy run, it wouldn’t be as effective. Like Coquelin, Ramsey also tried this because for Arsenal, the ball-players from deep are the centre-backs so that by pushing up the pitch, he could theoretically make space for them to pass it through to him in dangerous areas. It was only in the second-half where he mainly tried to stay deeper to try and instigate play. 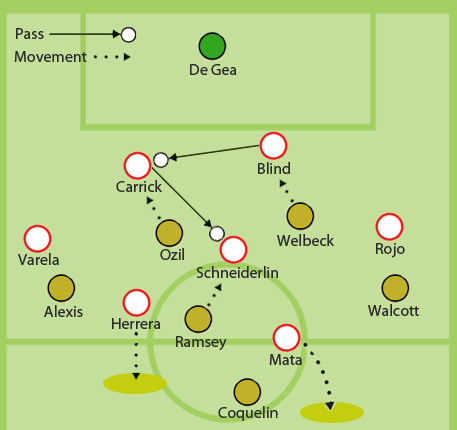 Arsenal also tried to mark in the midfield, and their strategy was a continuation of what they attempted to do in the first-leg of 2-0 defeat to Barcelona in the Champions League where in various phases of play, they pressed high. Here though, Manchester United were more inclined to go direct than usual, and in the times where they passed the ball through midfield, The Gunners were normally 2-3 yards off their man and therefore, unable to unsettle them in possession. The constant interchange of the front three probably didn’t help, however, the man-marking was muddled. Mesut Ozil would press as a centre-forward alongside Welbeck or Walcott while Ramsey would push up to mark Schneiderlin, meaning Coquelin had acres of space to cover on his own. The two examples I use for the above image highlight this fault; the first on 10 minutes and the second on 33 minutes where Arsenal tried to press from the goal kick but United stretch the pitch sideways and play around them. 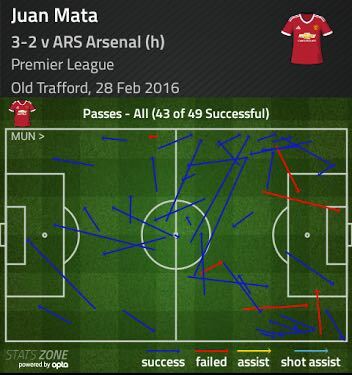 On both occasions Juan Mata is buzzing around the sides of Coquelin, looking to dart in behind. Eventually, he got his reward by playing a huge part in both the first-half goals, firstly picking up the ball in the space between-the-lines as Walcott lost the duel, and then darting into the box as the cross was played towards him. Agonizingly, he missed it but Gabriel hashed clearance was only able to fall into the path of Rashford to guide the ball in. For the second-goal, as Coquelin loses the ball looking for a pass to Walcott who tried to spin in behind rather than drop short for the ball (incidentally, I argue that his overly forward thinking movement was partly at fault when Arsenal conceded the opener against Barcelona). Quickly, three players make runs around the space that he patrols, eventually getting the ball to Mata in the centre-circle to spread the ball wide. Once the ball reaches the edge of the box, again Mata can play the ball to the right-flank before Jesse Lingard is able to cross to Rashford to head home. At the end of the game, Wenger might have been able to point out that most of United’s chances came from crosses, thereby supposedly exonerating his wingers from blame. However, that is precisely the point. With the wingers so attack-minded, they were unable to funnel back in time to stop the crosses. The other issue is that although Wenger tried to implement a higher press here, Arsenal are still very passive in the middle third of their own half once the ball is played through. 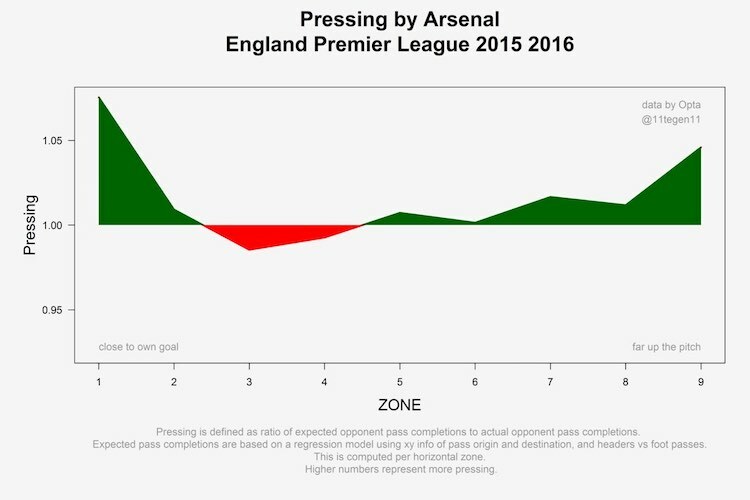 The team generally tries to get into shape once the ball reaches that areas but as shown by the intensity of Arsenal’s press from the graphic below, by the time the ball is played through to the final third, they often have to rely on last ditch and desperate challenges. When Arsenal got their first-goal, from a Welbeck header, it came from a good passing sequence at the back which saw Mesut Ozil finally having to funnel deep for the ball. For much of the game, and as he has done more recently, he played much more as a second striker. However, the move so nearly broke down when he was forced under pressure, to spread the ball to the flanks. Thankfully, Nacho Monreal kept the ball in play, headed it inside to Ramsey who proceeded to do the same, flicking the ball onto Alexis who was fouled. This is what Arsenal actually do quite well; using the flanks to build play and then combining in the half-spaces. In this game, Welbeck was Arsenal’s most dangerous player early on when he drifted inside from the right flank (but after 20 minutes, was moved to the centre). He was forced to do so however, because Arsenal struggle to effectively position their players in the build-up ahead of the ball, therefore are forced to go wide and back in once, and if, they the right combinations. It’s a problem because Ozil generally starts very high up the pitch while the wingers are strikers. That means there are often no players between-the-lines. The central midfielders can’t do it because usually they’re engaged in a different game in the middle, trying to run into space to drag players out of position rather than being an option on the ball per se (see Coquelin – though even Ramsey falls into this trap). Ronald Koeman says it is important in the build-up to create this extra line, by having the midfielders going “five steps in behind.” Instead, for Arsenal you often see three players close to the opponents’ defensive line doing very little, therefore quite frequently, the burden falls to Alexis, once the ball is spread wide, to step in 5-6 yards inside to create that extra man. Ramsey, playing wide right, use to alleviate this issue somewhat. There’s a wider point here, too, because it’s difficult to think of many sides in the recent past having success with a 4-2-3-1 formation featuring a No.10 like Ozil, and two forwards on the flanks. Usually, the playmaker is multi-functional – think Wesley Sneijder for Inter-Milan or Oscar for Chelsea last year – or at least one of the wingers is a work-horse or a creative midfielder. At this moment, it seems as if Wenger feels Alexis Sanchez can fulfil both roles. In the recent game, Barcelona showed Arsenal how the 4-3-3 allows better coverage even by playing three strikers. Because, while Arsenal might have thought they would get some joy down the flanks as Messi, Suarez, Neymar didn’t defend, the formation they used allowed them to move across the pitch better to shut off the space. Arsenal, by using three strikers, plus Ozil, against Manchester United, were unable to do the same. Next articleAre Arsenal set up for life without Arsene Wenger?